Running toward a new challenge: with the Ultimate V Light SO Hooded Jacket Men, your mountain training just has to be a success. The jacket is made from a lightweight, windproof 3-layer Gore® Windstopper® material, with a DWR treatment on the outer material for a water-repellent effect. A membrane between the outer and inner materials provides additional waterproofing. The pre-shaped hood with a strategic rubber band protects you from the rain and damp conditions. 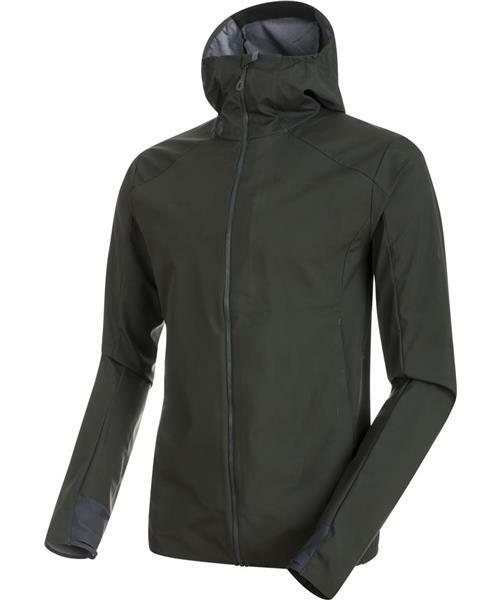 The smooth-running YKK® Vislon® front zipper, internal and external pockets and underarm zippers for extra ventilation make the jacket very easy to use. It also features new bonded and laser-cut thumb loops, as well as a partially elasticated hem for a better fit. Partially bonded hems ensure a streamlined and technical look and avoid friction on the skin. The Ultimate V Light SO Hooded Jacket Men combines weather resistance with comfort – to ensure nothing gets in the way of your training!